When I received Gurumayi’s Message for 2016, I felt I was receiving her grace. Shri Guru's grace, combined with my own effort, gives me the ability to keep moving on the spiritual path. Thank you, Gurumayi ji, for such a divine and powerful Message. As I was looking out my window onto the East River here in New York City, I was struck by the reflection of the sun and the way it was hitting the river. The beauty of that moment was beyond words. And what came to mind was the scintillating power of Consciousness. As I continued to stay with this very alive scene in nature, I soon realized that the river is always, always moving—moving with great steadfastness, no matter what the weather or the seasons. I realized that this river I look at every day is moving toward its ocean source, much like I am moving steadily toward the source of the joy in my own being. I feel so grateful that Gurumayi's Message was reflected so powerfully to me in nature within this city. Thank you, dear Gurumayi. I am moved by Gurumayi's Message to experience joy in my life, and to rededicate myself to the Siddha Yoga practices. 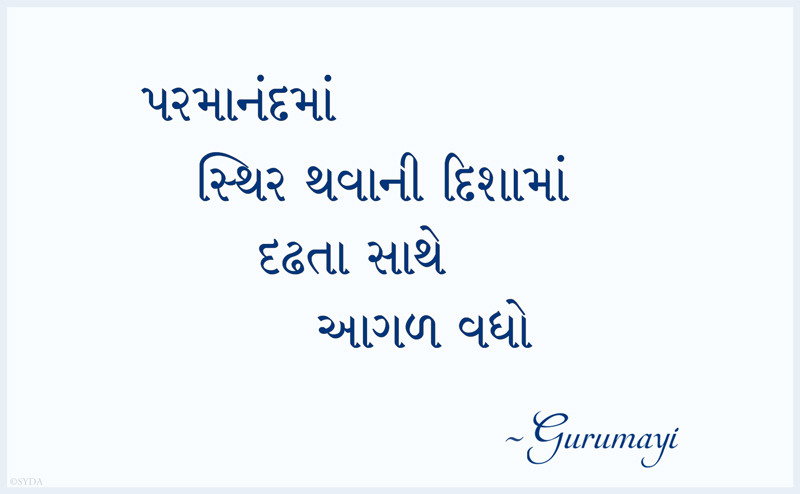 I move my body out of bed to recite Shri Guru Gita and the mantra, to practice hatha yoga and to meditate. I have become aware of movement within me, even during stillness: the movement of my breath, the movement of my thoughts, the movement of Kundalini Shakti within. Thank you, Gurumayi, from the deepest place in my heart. By your grace I am taking this opportunity to expand my sadhana! 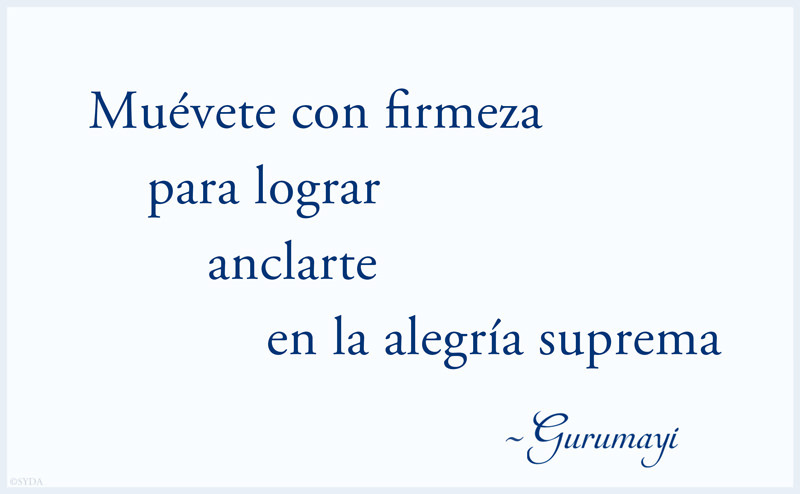 Each time I hear, read, and think of Gurumayi’s Message, my heart fills up with great joy and love. It feels like my heart is overflowing, like a glass filled to the brim, with streams trickling down from all sides. Thank you, Gurumayi, for your beautiful Message! Since participating in A Sweet Surprise Satsang, I have felt a shift in my inner awareness. I am particularly drawn to the words move and steadfastness, and I experience both inner and outer changes taking place. Movement is taking place in the form of scriptural study, chanting, and longer meditation—and also on the mundane level of cleaning closets and releasing things no longer needed. It is an amazing process. When I encounter discomfort, steadfastness—which I experience as an inner knowing that there is certainty of support—comes to me and allows the movement to continue. For the first time, I allowed myself to listen to Gurumayi's stories and teachings in A Sweet Surprise Satsang as if she were talking just to me. Her voice felt intimately close. I experienced an exquisite sense of fulfillment as she guided me to understand the words of her Message. And I sat focused within myself—receptive, gentle, calm, silent. Gurumayi's Message affirmed my understanding that my joy is a gift—and that I can be grounded in joy as a complete expression of my Self. Thank you, Gurumayi. I will work steadily to remain connected to the beautiful experience and meaning of your Message this year. Since receiving Gurumayi’s Message, I have felt my heart totally connected to my Guru, and I know that each word of the Message is filled with her blessings. In particular, the word move has been imprinted on my awareness. Every moment it is as though it pushes me ahead, helping me to develop detachment from worldly distractions and to move toward the center of my being. It’s an amazing feeling. Thank you, Gurumayi, for being with us in our journey of life, for protecting and guiding us to move forward, for reminding us what our purpose in life is. Thank you for sharing so much joy and bliss. In meditation, as I was silently repeating the words of Gurumayi’s Message, I saw myself standing in the hatha yoga pose of the warrior. Later, I began naming the qualities that I perceive in this posture: focus, determination, courage, presence of mind, and—what stood out most today—the ability to discriminate about what is truly worth fighting for. I was so happy to recognize that I do have these qualities within. 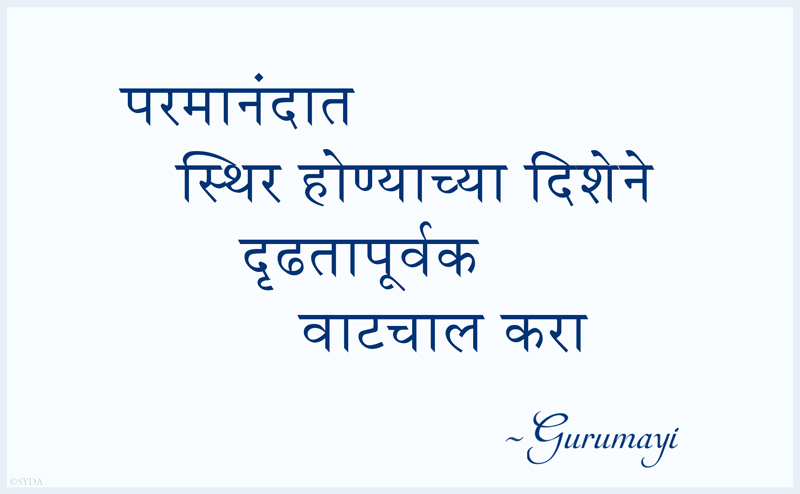 And I realized that I can benefit so much more by further studying and assimilating Gurumayi’s Message. My engagement with this contemplation is developing the faith that any effort I put forth will help me to further develop these inner qualities and put them to good use in my life. Thank you, Gurumayi, for your incredibly inspiring Message. With your support, I will strive to be a warrior now, in pursuit of becoming grounded in my own happiness. 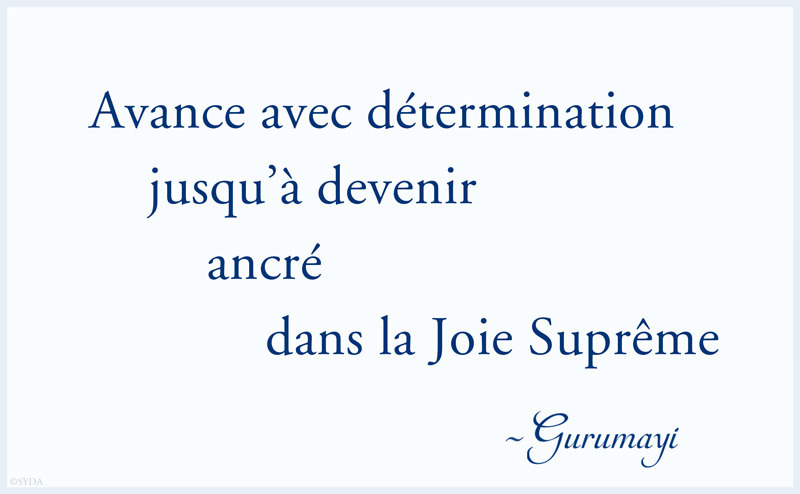 I use Gurumayi's Message for contemplation and meditation, and I often repeat it to myself. An anchor is a powerful symbol for me, and I ask myself what it would be like to be that firmly established in a state of the highest joy. I do get experiences of bliss, and I am going deeper, and more frequently, into that space. The worship of Lord Surya and chanting Shri Guru Gita have continued to carry me in the powerful grace that Gurumayi has bestowed on us with A Sweet Surprise 2016. 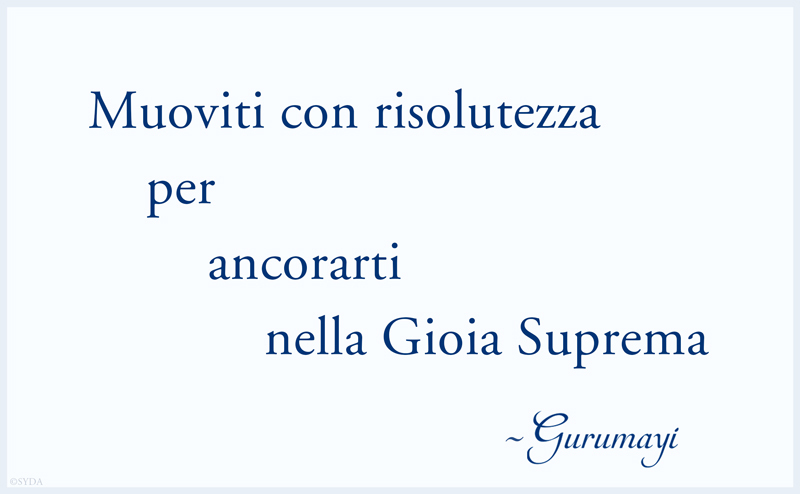 When I received Gurumayi’s Message for 2016, I began my contemplation by reflecting on the word supreme—what it means for me, and how I can apply it in my practices. On the morning of Makara Sankranti, when I was in Gurudev Siddha Peeth to offer seva, the meaning of the word supreme became clear for me. I understood it as: “at a level of absolute subtlety and purity.” Holding this meaning in my mind, I went to meditate. I began my meditation by observing my breath. In a few moments, the breath moved upwards, became very subtle, and entered my sahasrara. I went into a deep, peaceful, and steady meditation. In time, when my awareness returned, I experienced around me Bade Baba’s expansive form, rising like a golden, shining sun. His body was shimmering inside and outside. I saw myself sitting in meditation inside Bade Baba. Now, whenever I recall this state, I feel myself surrounded by Bade Baba’s body and I experience lightness. Thank you, my Sadguru, whose greatness cannot be transcended. 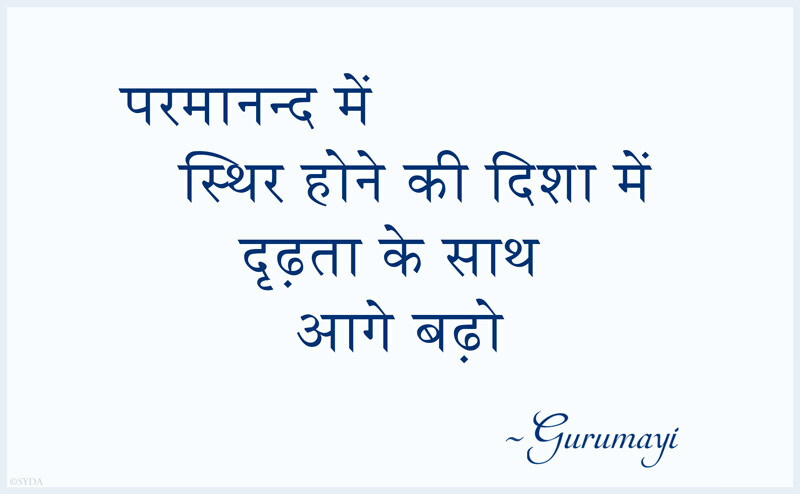 My heart leaps with bliss as I contemplate Gurumayi's Message for 2016. I spend a lot of time in boats, so the word anchored has an especially significant meaning for me. I can picture myself being grounded, holding steady, being content, as I continue on with my journey. Receiving the Message was a benediction for me, and it has taken root in my heart. 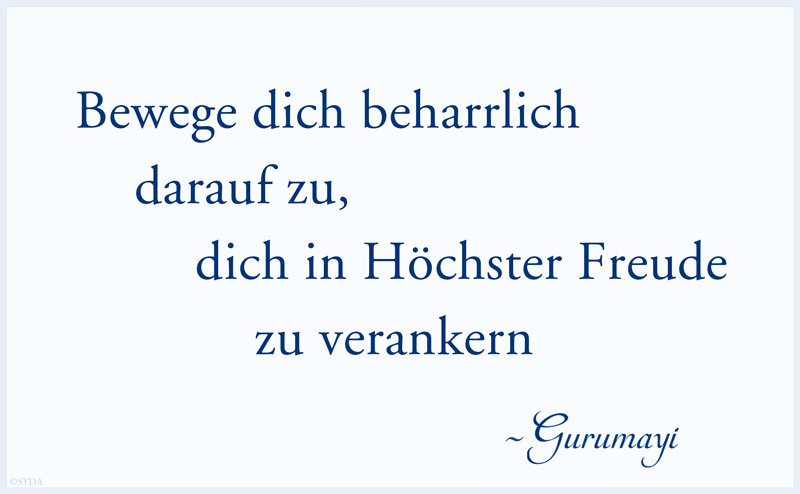 I love you, Gurumayi, and I know that my sadhana this year will be profound as I dive even deeper into my heart. The word from Gurumayi’s Message that right now stays with me the most is anchor. It is the reason that I came to Siddha Yoga meditation—to rely on the Self as something that is unwavering. For me, to know of this anchor in my being creates an immense longing in my heart. Gurumayi, thank you for this gift. Thank you for every gift you give me. When I first heard Gurumayi's Message, I visualized a ship lying at anchor, bobbing up and down on the waves, without ever moving from its position. I could see that this dynamic balance is a great way to practice the Message. I can stay anchored in my intention to remain aware of the joy of the Self, even while all the storms and hurricanes of life take place—just as a ship at anchor must continually shift slightly in response to ever-changing waves and swells. Remaining flexible, while moving forward with a steady intention, helps me to follow a pathway to that state of great joy. Throughout my day, whether I am at the bank, shopping, or teaching, when I remember to inwardly repeat Gurumayi’s Message, I can see people's faces changing. They begin to smile back at me! 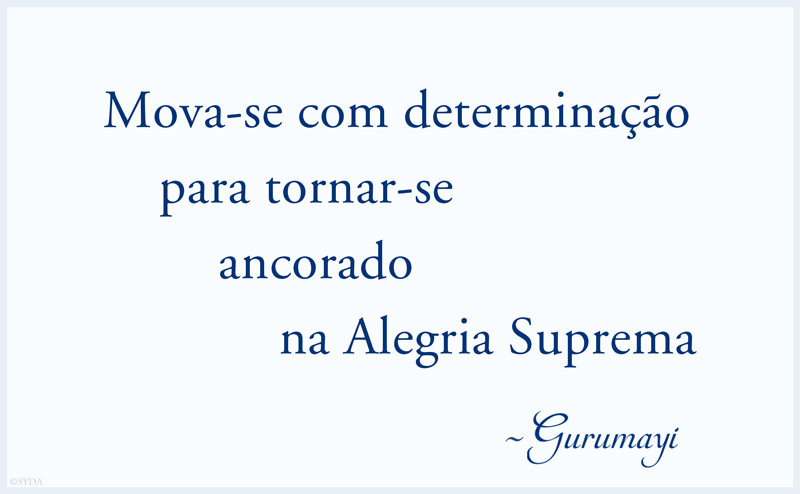 I’ve come to realize this is why I am smiling on the outside: the Guru's words are vibrating inside me. And their positive energy is contagious! Thank you, Gurumayi. Thank you, Baba. Thank you, Bade Baba. Thank you for filling my life with such joy. The world is a beautiful place for me because of your teachings. Ever since I participated in A Sweet Surprise Satsang, this phrase has been arising within me throughout the day: "patient, loving kindness." It springs up when I am in a hurry, when I feel stress at work, and when I am in conversation with someone and I’m not giving them my full loving attention. At that time, Gurumayi's Message seems to pour into my heart, then translate into actions according to the needs of the moment. Thank you, Gurumayi! Thank you so much for speaking directly to my life-in-action! Since receiving Gurumayi's Message for 2016, I have felt joy bubbling up inside of me at various moments throughout the day. Sometimes I feel like giggling, as if I am being gently tickled from within, or as if I have just heard the punchline of a delightful joke. I feel that an ancient fear has left me. I have the sense that no matter what happens, I am profoundly cared for. Moods and emotions come and go, and yet beneath them I sense an unbroken stream of joy. The world feels benevolent at its very core, and I want to praise God and offer my thanks over and again. I know that this awareness is taking place within me due to Gurumayi's grace. Thank you! Gurumayi’s Message for 2016 is so wonderful and profound. I am already experiencing the grace I find in it. Walking to work yesterday, I made a conscious effort to let go of my everyday concerns. I remembered the Message and turned my attention to the sound of the breeze in the trees, to the warmth of the winter sun, to the beauty of the brilliant light. I felt a deep peace and sense of freedom arise in that moment and each time I practiced this throughout the day. I feel that one of the best ways for me to attain the goal of Gurumayi's Message for 2016 is to recite Shri Guru Gita daily. January 20th marked the second anniversary of setting an intention to recite this magnificent text every day. I felt so supported, in the last week of fulfilling my initial intention, as I recited Shri Guru Gita with Gurumayi via the Siddha Yoga path website during the Makara Sankranti satsang. I have experienced such tangible grace in so many ways this week! I look forward to continuing this daily practice. Thank you, Gurumayi, for your presence and guidance. I treasure your support for attaining the goal of your Message. Gurumayi’s Message for 2016 is a precious gift and treasure, and I feel deeply moved to have these words carving out a pathway for my year's study. At one point I was repeating the words of the Message very slowly, over and over. As I did this, each word ripened like delicious fruit into its meaning! The meaning of the words washed over me and deeply penetrated my being. I knew this was an experience of the power of the Guru's words. I am filled with awe and gratitude. 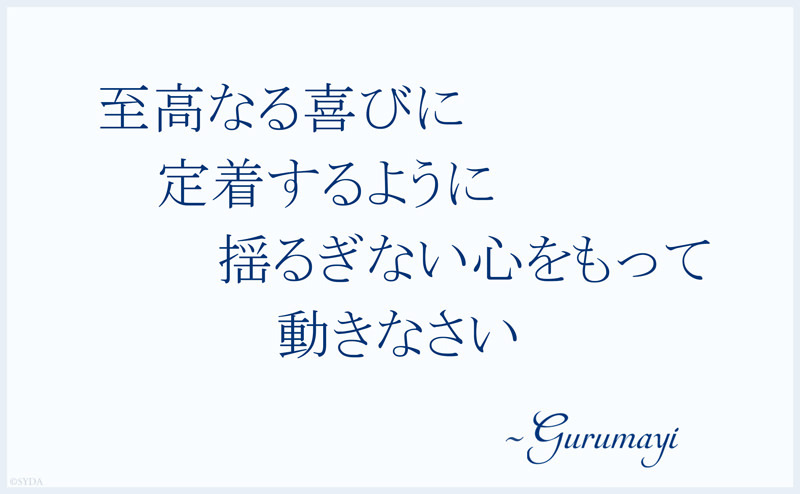 I was so delighted when I heard Gurumayi's Message on January 1! I am already relishing the fruits: practicing the Message enables me to stay longer in deep meditation. Gurumayi’s grace is so abundant! Yesterday, the sun was shining over the countryside, so I decided to walk on a new pathway, toward a new destination. 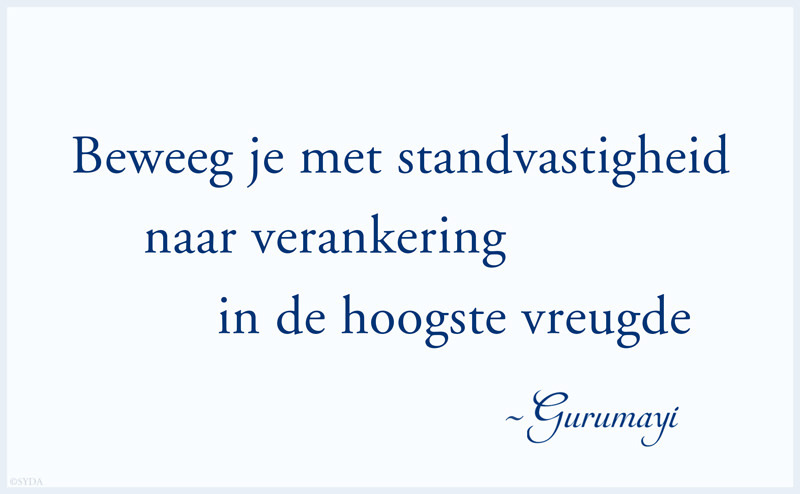 At the same time, I was following my inner path with the awareness of Gurumayi's Message. As I entered a hamlet, I met people working at their farm, and I shared joyful words with them. I was very glad to see the faces of those people shining with happiness and sharing, in return, the simplicity and beauty of their life. While continuing on my way, I felt the contentment of being centered in my heart. Thank you, Gurumayi, for your Message. It brings me so much vigor! When I heard Gurumayi's Message for 2016 in A Sweet Surprise Satsang on January 1, I thought: "This is the perfect goal for the spiritual path!" And this is just what I feel that Gurumayi has been leading us to be: firmly planted in our awareness of the light of the Self, regardless of the external movements and happenings of life around us. Just thinking about the Message makes me experience a wave of bliss! Thank you, Gurumayi, Baba, and Bade Baba for your continuing joyful example and inspiring grace. Gurumayi's Message reminds me to pursue, with great enthusiasm, the direction that my soul should take: toward the increasing light of my most sacred center, toward the effulgence of supreme Reality, whose existence I was able to sense in A Sweet Surprise Satsang. Thank you, Gurumayi, for your compassion, wisdom, generosity, and great love, and for taking us to God in such a beautiful and joyful way. May I do my best to study, comprehend, realize, and apply your teachings. Yesterday, as I practiced contemplating one of Gurumayi's teachings, I felt the awareness of love in my heart so strongly. I then realized that it was a taste of the goal that Gurumayi refers to in her Message for 2016. I feel this realization strengthening my resolve to trust the Siddha Yoga practices as tools to bring the Message to fruition in me. Gurumayi's Message for 2016 is a great gift to me, and I feel uplifted. All my heart says, "Thank you, Gurumayi." The day after receiving Gurumayi's Message for 2016, I sat to meditate. I repeated the words of her Message several times, letting each word penetrate my awareness as fully as possible. As I entered meditation, a gorgeous image arose from the divine inner silence. I observed a scuba diver descending into a tranquil, light-filled ocean. Alongside the diver was an enormous, solidly moored, underwater rock. The rock face was smooth; the diver, focused on her goal. The pathway was clear and direct. I feel blissful and brimming with love and gratitude to Gurumayi for this great gift to guide my sadhana. Such inspiration. Such loving and compassionate guidance. So many layers of teaching, ever unfolding. 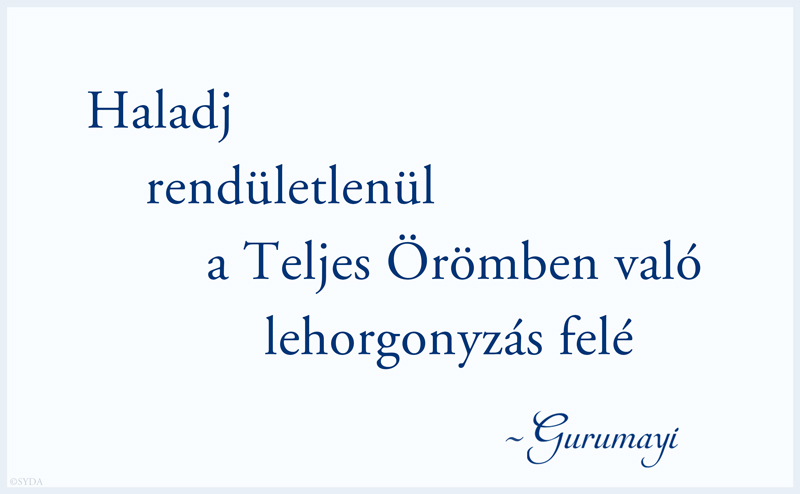 It is only January, and Gurumayi's Message is already exploding with meaning in my mind and heart. With this Message, I have the sense of being lifted by the hands of grace and propelled with every moment of self-effort toward the goal. I know the Guru's love, grace, and guidance to be unceasing and ever present. May my self-effort be unceasing too and my intention to reach the goal ever present. As I read Gurumayi's Message, I feel its energy moving within me—from the base of the spine to the crown of the head—as colored light rays. The space of meditation attracts me steadily, like a magnet. I feel really joyful. Gurumayi feels so near. Thank you so much, Gurumayi. How sweet it was to join Siddha Yogis and new seekers in the Universal Hall for A Sweet Surprise 2016! I am filled with gratitude to have spent the morning receiving Gurumayi's Message, listening to her Message talk, and engaging in the Siddha Yoga practices. I have been repeating Gurumayi's Message as a mantra throughout the day and as I do, a warm feeling spreads throughout my body. I am so excited to continue to engage with it and to see how it will unfold for me throughout this year. Thank you, Gurumayi, for your Message—a pillar to support my sadhana throughout 2016 and many years to come! In the week leading up to January 1, I was preparing to offer seva for A Sweet Surprise Satsang, but a situation arose in my life that made me wonder if I would be able to perform that seva in the right spirit. One day I sat in front of my puja asking Gurumayi for guidance. I repeated the mantra, and after some time, from within arose the knowledge of the happiness that lies beneath everything. I heard the words de hoogste vreugde, which in Dutch means “supreme joy.” I was delighted with this guidance! And so it was on January 1! While Gurumayi spoke, I was overwhelmed with gratefulness. What a Message, and what deep personal meaning for me. Gurumayi, thank you from the bottom of my heart for your blessings. I will practice your teaching.